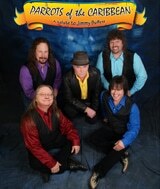 Together this group of five musicians exemplifies a wide variety of talent second to none. 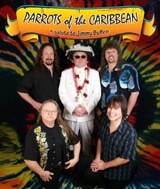 Parrots of the Caribbean will bring excitement, energy and first class musicianship to your event. It’s a show you won’t soon forget! Dave bought his first harmonica at the age of 18 and by the age of 30 he landed a front man position impersonating “Elwood Blues” aka Dan Akyroyd in a 9-piece Blues Brothers Band based in Dayton Ohio. For the next 5 years the band traveled across the U.S. performing in theaters, civic arenas and concert halls. Soon after, Dave signed with “Legends in Concert”, a top ranked show of impersonators based at Imperial Palace Casino in Las Vegas where he was employed for the next several years. Long before the advent of the “Parrotheads”, by the early 70’s, Dave was inspired by his love for the music of Jimmy Buffet, and took his passion for musical performance in a new direction. With his previous experience singing and dancing on stage, the transition to his Buffet act was just a matter of perfecting the song lyrics. 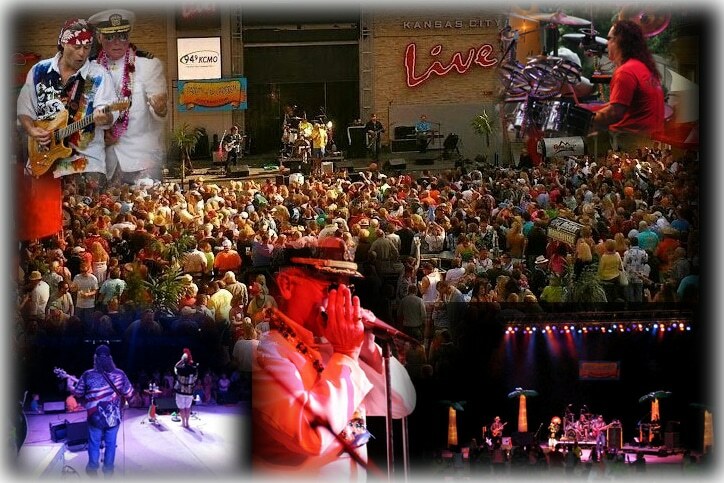 He gathered some of the finest seasoned musicians for his new band, Parrots of the Caribbean, and over the last 7 years has earned his acclaim as the #1 Jimmy Buffet tribute act in the country. Gary “Riptied” Rigmaiden, bass player and back up vocals for the group, has been playing bass for 25 years professionally and is an original member of the Parrots of the Caribbean band. Gary hails from Lake Charles, Louisiana and musical influences range from Creedence Clearwater, Rolling Stones and Zep to John Hiatt, Stevie Ray, Merle Haggard and of course Delbert. A song writer and closet classical guitar player (wannabe) his favorite thing about being a musician/songwriter is the ability to express ones self and communicate in melodic form, actual feelings, emotions and ideas. Jeff “Hawaiin Hillbilly” Cline, lead and rhythm guitar extraordinaire plus lead and backing vocals is as diverse in his styles of music as his heritage. Jeff was born to a Polynesian Mother from Oahu, Hawaii and an Air Force Father from Kentucky. He was born in Dayton, OH then moved with his family, living in three states and Germany before returning to Dayton as a young teen. Jeff’s interest in playing guitar turned quickly to his passion and he started his first band when he was sixteen. Throughout Jeff’s career, he has played Rock, Blues, Fusion, Funk, Country, Pop and all points in between, resulting in the “Monster” guitar player he is today. Kenny “Tips” Rice, affectionately called “The Professor” is a keyboardist extraordinaire! Kenny has been playing since he was 8 years old. Classically trained, he has been a professional musician for over 40 years. Performing all musical genres worldwide, he is a “Funk Master” on the keys. He is also accomplished in band direction, music arrangements, and studio production. Kenny, as a pianist/keyboardist was active in “Up with People”, founding member of progressive rock band “Flyweil”, and long time keyboardist for the eclectic rock band, “The Hathaways”. He’s performed on the Tonight Show, HBO, and has opened for such artists as Edgar Winter, Cheap Trick, Tower of Power, Eddie Money, Rich Little, George Carlin, Michael Bolton, and Willie Nelson. Other Projects = Arch Rival, Jake-n-Elwood’s Blues Review, Groove Therapy, VooDoo Stew, Eric Hilgaford-&-the Magic, Paradise Boulevard. Drumming Influences = D. Weckle J. Bohnam, C. Watts, R. Guth, N. Peart, T. Aldrige, S. Philips and all other players out there doing it right. Band Influences = F. Zappa, R.H.C.P., Peter Mayer, ZZ Top, Dr. Hook, Zepplin, Stones and all other bands out there doing it right. Places Lived = Texas, Ohio 3xs, Germany, California, Indiana.